Today is a homeschooling post. I love homeschooling. It is the tops. I’m not very patient, and homeschooling elementary school has been challenging for me. Crafts and finger plays not appealing. Teaching handwriting like pulling teeth. “Whatdya’ mean you don’t remember what a contraction is?” I’ve decided that you don’t have to have patience to homeschool, but if you don’t, you’d better have some self-control/self-discipline. Fourth grade, however, is turning into fun because the topics are becoming more advanced and the student more independently capable. But no matter what, the whole homeschooling ride is one I wouldn’t trade for the world. Up now–grammar and writing. Last homeschooling post was math. Daily Grams The daily grams are one page, cumulative worksheets, reminding me of the cumulative concept of Saxon Math. Capitalization, punctuation, adverbs, adjectives, prepositions, objects of the preposition, complex sentence formation, and more–they are all reviewed throughout the year so the student doesn’t forget the concept even if they learned it on day 1. Daily Grams are designed to do one worksheet a day, requiring maybe five minutes or so. 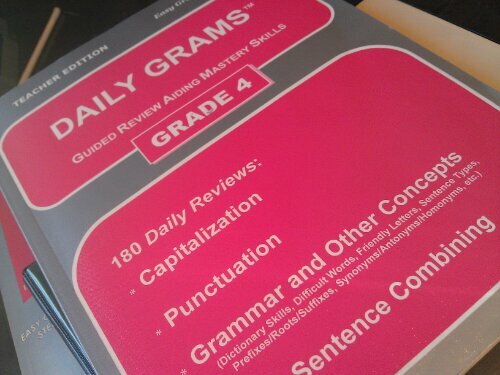 For second grade, I used ONLY the second grade Daily Gram book for the entire grammar course that year. When third and fourth grade came, I wanted more focus and explanation of each grammatical concept with more practice than the Daily Grams offered. So I bought the Easy Grammar text. Easy Grammar: Grade 4 Okay. 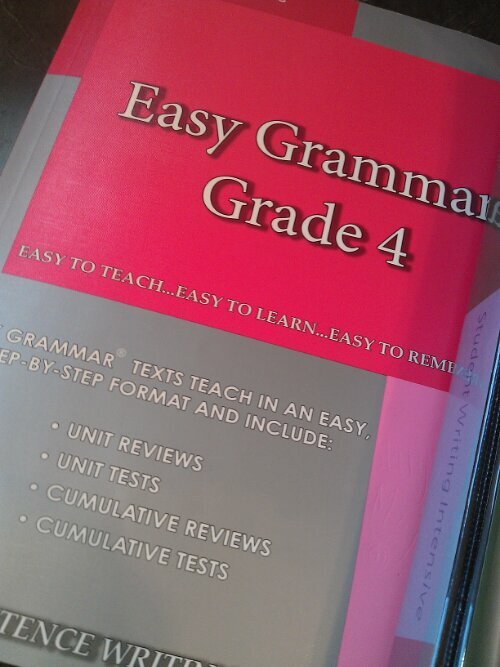 There are three books you can buy: Easy Grammar Grade 4 teacher’s edition, Easy Grammar Grade 4 Student Workbook, and Easy Grammar Grade 4 Student Test Booklet. I purchased only the teacher’s manual. However, the cover of the book I bought doesn’t say “Teacher’s Manual!” It only says “Easy Grammar Grade 4.” The teacher’s manual contains the grammatical explanation text, worksheets, reviews, tests, answers, and teaching tips all bound together in one book. My daughter works from the teacher’s manual. One very minor glitch in this is that the answers are on the left side of the page and the worksheet/ test on the right side of the page. We cover the answers with a sheet of paper and have no issues. Alternatively, you could copy the assignments ahead of time from the book so the answers aren’t tempting your student. Another minor glitch with using the teacher’s manual for the student textbook is that they can read the author’s tips to the teacher if they wanted to. No biggie to me. It’s all black and white. Often this can be a deterrent, but I feel in this case it is a strength. Wanda Phillips, Ed.D. runs such a tight ship with the books. Seriously, she manages to get what you need in there with nothing extraneous to distract and frustrate! It’s a clean, concise machine. Work usually can be completed independently without much, if any help. I love this. The author teaches a prepositional approach to understanding sentences, allowing easy recognition of the parts of a sentence. One of the hardest parts of the book is having the kids learn the required prepositions at the beginning–after that they then look for prepositional phrases and can exclude them from searching for subjects and verbs. Makes understanding the parts of the sentences much simpler, but they have to do a little work up front which can seem intimidating. We memorized them over a few weeks and continued on. Pages are not perforated in the teacher’s manual or Daily Grams. You cannot tear them out easily, which can be a problem if you only buy the “all-inclusive” book I bought, as the answers for the worksheets are sitting right on the next page. At the end of every chapter, there is a chapter review, a cumulative review, and a cumulative test. I did not make my daughter do all of those as it was way too much busy, repetitive work if she understood all the concepts! However, we usually did the chapter review and the cumulative test. I really appreciate the cumulative nature of this text! The difference between the Daily Gram Worksheets and the Worksheets is that the worksheets pertain only to the material being learned in the current chapter. The Daily Grams are cumulative and very quick and concise. I did both because I like repetition and always having the brain presented with what it learned in the past, so it doesn’t forget. However, I do think we could have gotten by in fourth grade without the Daily Grams. There is no writing practice. This text doesn’t try to incorporate writing skills with the grammar skills–EXCEPT she does have the kids practice combining simple sentences into complex sentences in the Daily Grams. My daughter can make nice, complex, grammatical sentences because of this text, but it does not offer writing practice. She provides enough teacher instruction without making you googly-eyed trying to sort through it all! Her tips are valid and thoughtful. This year, I decided to actually double up on her grammar lessons in the first semester. She did two Daily Grams every day, and I mapped out the Easy Grammar: Grade 4 text/worksheets/tests so that we finished it in one semester. Even doing this double-pace, she rarely punked an attitude about grammar! Whew! I chose to do this so she could begin focusing on writing in the second semester–rather than combining them together throughout the year. I thought she’d do better focusing on one side of “writing” at a time–grammar first and then actually putting together ideas. So far, I’m very pleased. This will not be a comprehensive review because I’ve only used the Writing Intensive Level A and that only for a 2-3 months. Teaching Writing: Structure and Style I also bought this because I thought I might need it; it was part of the package. I have not watched it yet! I plan on it, but we have had NO problems doing the Student Writing Intensive Level A assignments just based on watching the DVDs and following the lesson plans. I don’t know when I’ll get around to watching this. Money could probably be saved by not purchasing this. Perhaps it was pregnancy brain, but I thought the binder/planner could have been organized just a wee bit better. We got it figured out. Students learn by watching a DVD and then applying what is taught to passages provided in the binder. The DVD is not divided up into lessons so you have to thumb through the planner and figure out when you need to stop the DVD. Basically, the DVD is just Mr. Pudewa giving his presentation live in a workshop to a group of children; it rolls from beginning to end. You or your child (if you’re trying to prepare lunch) has to know when to stop it. Minor complaint, but I wish they’d break it up according to their lesson guides. My daughter really liked this program at first because Mr. Pudewa was funny and it was new and exciting. As she has been required to write more and more, she doesn’t like it so much anymore. She hates the physical act of writing and she now transfers that on to poor Mr. Pudewa. But I still think it’s one of the best programs to get her to do writing. 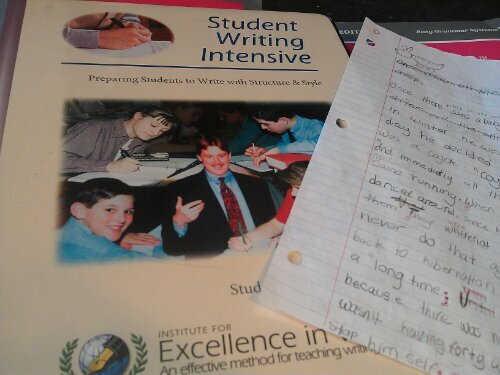 IEW teaches writing by using existing written passages/stories and outline formation. I was ecstatic to see outline formation taught to her at such a young age! It will serve her well throughout the rest of her education! She keeps asking when she can “write her own story,” so she does have a sense that she is not really writing with this approach. We are not yet through the complete program, and this may come later–I don’t know. If not, no biggie. I’ll just have her write her own story! I saw a friend had the Ancient History based writing lessons! This is a part of IEW’s “them-based writing.” As I looked through it, I realized that it was teaching everything that is taught in the Writing Intensive A! We will definitely be purchasing some of these themed books to use for writing after we finish the Writing Intensive. I would suggest you look, read, and ask around because you may be able to skip the Writing Intensives and just do these nicely bound theme-based books without missing out! They looked awesome and it really seemed to be teaching the kids the same writing concepts as watching the DVD! I guess that’s it. That’s how we’ve opted to handle grammar and writing this fourth-grade year. How about anyone else? What do you think? What do you use? Love? Hate? And after deciding on a curriculum, does anyone else have trouble sorting through exactly which books of the curriculum you need to buy!!? This entry was posted in Fourth Grade Curriculum, GAPS, Grammar, Homeschooling and tagged Do I need Daily Grams for Easy Grammar, Easy Grammar review, Fourth Grade, Grammar, IEW, Institute for Excellence in Writing, opinion, Review, Writing on February 27, 2014 by thehomeschoolingdoctor.